Collaboration is particularly fun when it is a collaboration with Taylor Greenfield. This month we created a wreath as a part of the Grand Rapids Art Museum’s show “INSPIRED BY THE SEASON” Our piece paper and found objects it was lit by LED lights and featured hundreds of white hand cut leaves sprinkled with red cardinals. A few hundred hot glue burns and we have wreath success: we are practically professionals! The show featured six Welcome Wreaths in the GRAM lobby, and ours was one of two collaborations. Artists included: Abigail Bradley; Alynn Guerra and Carlos Aceves; Derrick Hollowell; Salvador Jiménez; Anthony Mead; and Jenn Schaub & Taylor Greenfield. 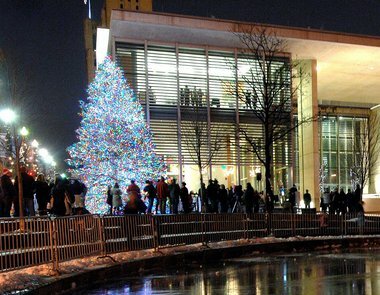 We didn’t get a picture of the wreath so i swiped this pic from MLIVE of the Christmas Tree outside the GRAM. Happy Holidays!